Daryl Dixon with his iconic chopper! Based on the likeness of actor Norman Reedus, Daryl Dixon is wearing his angel wings-stitched biker vest and his trusty crossbow is across his back. 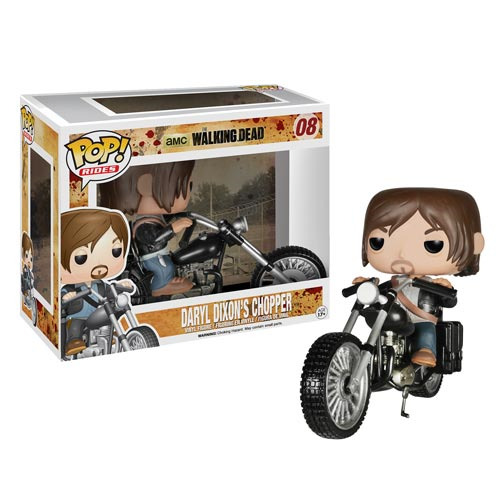 Fan-favorite Daryl Dixon, from AMC's hit television series The Walking Dead, balances perfectly on the chopper or you can pull him off to display beside the bike. Rick Grimes and his group live in an unpredictable and perilous apocalyptic world - collect Daryl to help them survive! Ages 17 and up.